Hi again! I have a hodgepodge of cute holiday treats to share with you tonight 🙂 They are from all over the grid, so I hope my post isn’t too confusing about where to find this stuff! The sweet and innocent looking mesh Flurry Dress can be found at Loovus Dzevavor hidden in the Peace On Earth Hunt 5 icon which is a globe. My Christmas Kitty Hat is made by CandyMetal and is the latest free group gift at Acid Lily. It also comes with a Christmas Lady shoulder cape, but it was interfering with the mesh dress I am showing today. Perhaps I’ll find something to wear it with soon to show you. It would be perfect to wear with a non-mesh top. Go check it out – so cute! The group is free to join, and there are still a ton of other gifts available sitting around the fashion gallery rooms. The Even.flow Mrs. Santa Clause Mittens (free gift) and Things I Love Snowman Bag (1L) are both available at the Winter Wishes Market along with tons of other gifts under 10L! These boots aren’t free, but they are worth a mention because they are a must have in your inventory this winter! These Multi-Change Uggs are made by Things I Like and they come with a hud that allows you to change the texture to several different shades / prints making them perfectly matched to any outfit! These are featured at the Winter Wishes Market for 99L. These cozy looking nordic leggings are Izzie’s group gift for December and they are available in four prints. The group is 250L to join, but there are always generous monthly gifts! Whew… are you still with me? 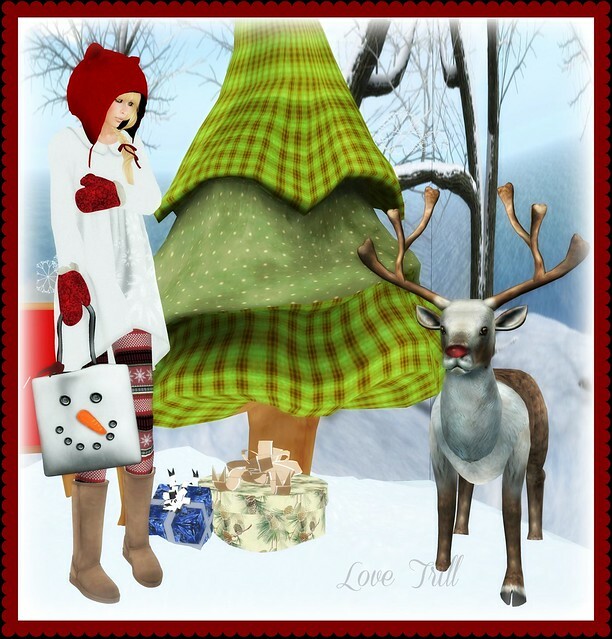 I have one more thing to share… The Christmas Scene you see is actually a background box that is perfect for photographers or bloggers in SL. You can pick this up at Katink for the Peace On Earth Hunt 5 – just find the hidden globe! Categories: accessories, costumes, dress, events, groups, hunts, lingerie, mesh, other, pants, shirt, shoes, skins, socks | Tags: Acid Lily, Al Vulo, Candy Metal, candyMetal, Even.flow, fab free, fabfree, fabulously free in SL, free, free sl, group gift, Ikon, Izzie's, KaTink, Loovus Dzevavor, Love Trill, Peace On Earth Hunt 5, PEOH5, POE5, Second Life, sl, Things I LIke, Wasabi Pills, Winter Wishes Market | Permalink.